Lanark and Hamilton East MP Angela Crawley has backed a Private Member’s Bill that seeks to end unfair benefit sanctions. The Benefit Claimants Sanctions (Required Assessment) Bill 2016-17 was introduced last week by Mhairi Black MP and has already won cross-party support from Tory MP Andrew Percy, Labour veteran Dennis Skinner, Plaid Cymru MP Liz Saville Roberts, Green MP Caroline Lucas, as well as her 53 SNP colleagues among others. The bill seeks to establish a code of conduct and official procedure for benefit sanctions and seeks to end the discrepancies between different sanction regimes – ensuring a fairer system of sanctions for everyone who uses the social security system. If passed in Parliament, the bill will mean an individual’s circumstances would be taken into account before a sanction can be implemented. While some Job Centres already have fair and compassionate sanctions regimes that take into account the individual’s circumstances and the negative impact that sanctions could have, others implement sanctions with less consideration of the circumstances and consequences. 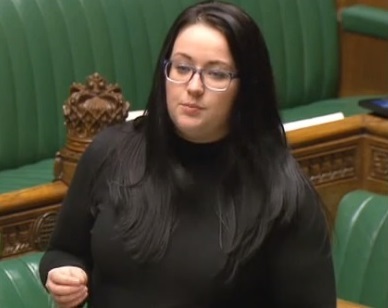 Local MP Angela says this is a particular concern for vulnerable groups including single parents and the aim of the bill is to bring compassion and consistency to how claimants are dealt with. “The bill put forward is a real opportunity to try and deliver a positive change for those who continue to be affected by DWP sanctions. “While there has been a drop in the number of people being sanctioned in my constituency, it is clear that there is still much work to be done. “Sanctions are proven to lead to increased demand for foodbanks, as well as huge amounts of stress on those individuals and their families. “Like many people I believe the current benefit sanctions process is impersonal, however, there is no point in this bill being just a protest. “Mhairi’s bill is a pragmatic attempt to address a serious issue and, if passed, will help to alleviate the worst excesses of the current process.